Well I just took delivery of a new Lenovo x121e ultraportable notebook. 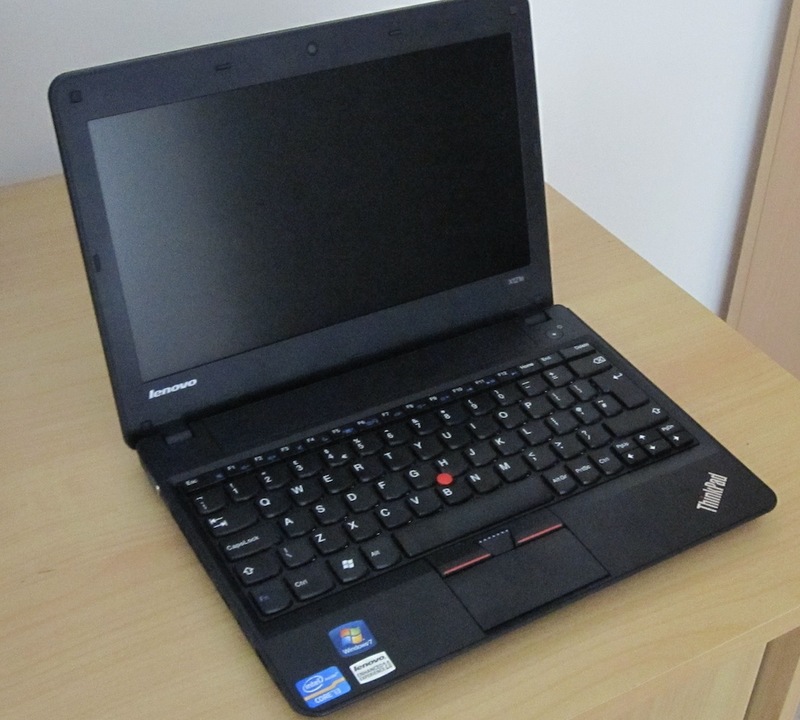 I had been looking at the Lenovo x100 series ThinkPads for some time, as I have had a number of older X40 and X60 12 inch models from work in the past and really liked the design and keyboard. Up till now however the current 11.6-inch screen Thinkpads had significant failings, either low battery life, or a huge battery jutting out of the rear of the machine like a wart. The previous CPU offerings were also not up to much. 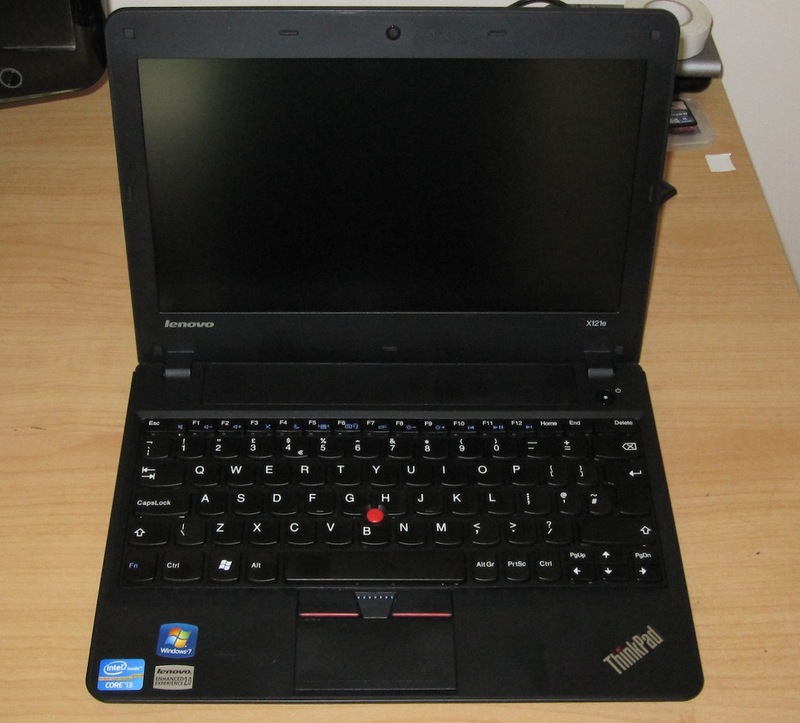 Ok the good news, this is a proper Thinkpad, very good build quality, solid case, no flex and a superb keyboard. Excellent. If you have ever used a Thinkpad keyboard you know what I mean. However, the trackpad is another matter. They have used a textured surface, which is ok, but the whole pad is a button hinged at the top, this makes it shift as you try to use it and hence inaccurate. I find this really a pain, so using a mouse. Also good news, it has a matt screen! 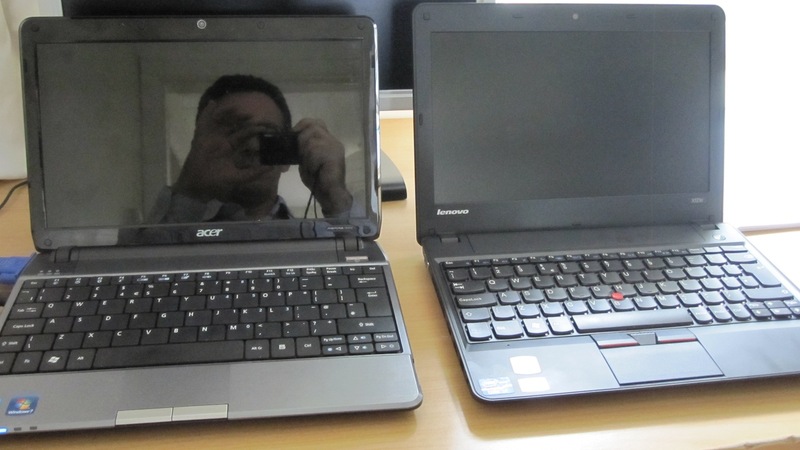 See the screen shots below in comparison to an Acer ultraportable with a glossy screen. The case is matt black and the screen back is a nice textured matt finish. It is clearly a business oriented design, but personally I like the lack of bling. Weight is 1.5kg with the 6 cell battery, I recommend getting this option, it fits well and doesn’t add much bulk, see images below. A big improvement on previous X100 class models. The machine doesn’t feel light though, but then I’m comparing it to a 13inch Mac Air. Well it has a basic pair of forward facing stereo speakers until the front lip of the machine, which is a good location, and they are ok for movies in a small room. The Bluetooth works well with my Creative D200 speakers so just use something like that for music playback or headphones. Haven’t really tested this in anger yet, but on full charge with the 6 cell battery the machine is quoting 6 hours time available. Will post more detail when I have tested it on the road with real world conditions. The wifi is (802.11b/g/n Wireless), it also has the usual VGA, 3 USB, SD card slot, plus HDMI and Ethernet ports on left side as well. Pretty much everything most folk require. An option is a built in Broadband module, the SIM card sits behind the battery. The windows benchmark performance tests rates the machine as 4.8. Figures below. Here are some brief thoughts on how it compares to some similar machines. This machine is a year older but very similar in design and size. Same 11.6 inch screen size. The Acer beats the X121 on battery life, it typically manages 7 hours on its 6 cell battery. Weight is almost the same. The big advantage to the Lenovo though is the keyboard which is much better in my opinion. Just benchmarked the machine using some custom Java code of my own that sweats a CPU and graphics card. The X121 is twice as fast as a Lenovo T400 Centrino, and 33% faster than a Mac Book Pro with 4GB Ram and 2.4Ghz Core 2 Duo from a year ago. Nice. Keyboard is the best you can get. Best point is the speed, which is partly due to the ridiculous amount of RAM I specified. This is a fast computer. Battery life is good with the 6 cell, not the best in class, but acceptable. Screen is matt and works well. Audio quality is ok, not tiny. Useful built in Lenovo utilities that help manage the machine, for networking, security and backup. There is one major flaw however, and that is fan noise. The fan kicks in at startup and stays on. Doesn’t matter what power options you select, I have tried them all, and still full on. I suspect this is partly due to the choice of a 7200rpm hard drive as these run hotter and need cooling. When I have time I will try an SSD drive and post the results. If anyone has an answer to this please let me know. I can see online other Lenovo notebooks had fan noise issues and sometimes a bios update can help. The noise level isn’t that bad, it is tolerable and at least is constant, not fluctuating which is generally more annoying. Would also like a higher resolution screen option. Just compared it to a 5 year-old Vaio ultraportable, and that beats the Lenovo hands down for screen resolution and sharpness. In summary, I’m happy with the machine, can see it being used a lot. It is fast, portable, and for the specification good value. Lenovo can we please have a bios fix for the fan noise, then it gets five stars, at present though only 4/5 stars. Question about the fan: is it always on after startup or is it occasionally turned off? I know the Edge has the fan at 100% at startup but is then turned off as soon you boot into the OS. Question about the screen: I understand it is no longer a 180 degree tilt on the screen, due to the hinge. Could you measure the angle? The fan is always on, although the power management help file says a dynamic noise control option exists but I cant find it yet. However, don’t be put off it is not that noisy, just in a quiet room you notice, and I’m used to SSD Macs now. The screen angle is only 140 degrees when fully open. Overall happy with it, and see my new comments on speed. Hi, I am really liking the look of this laptop but there was one thing which I am still not sure about. If I hooked this up to a 1900 x 1200 (or 1080) monitor would the computer be able to cope? would I be able to watch a film/do work on it? According to the Lenovo Tech sheet on their web site, it can drive high resolution monitors, haven’t tried to yet. Certainly plays films at 720 no problem, an AVI of The Matrix Reloaded was smooth as silk. will something like Dreamweaver run on this with any problems? Should do, especially with 4Gb or more. Its the fastest machine I have out of several Macs and PCs. Really confused between the AMD Fusion processor and the Intel i3 Core option that they are giving. Am a naive when it comes to processors, which one would you recommend? Personally I would go for the intel i3 core chip, my past experiences with AMD suggest they tend to run hot. And the i3 is very fast. Hm. I’ve been searching for a good, sturdy, affordable subnotebook with a quality keyboard. This Lenovo seems to fit the bill exactly, and I was so close to buy it until I read about this fan-problem you report here. I have a MacBook since 5 years, and the fan noise it emits, the heat problems etc, makes it unusable. Is this fan noise of the Lenovo really that bad? Did you have any more luck in controlling it? Since I don’t want to ever have this annoyance once again, I’m not buying laptop macs ever again. Just want to know how loud this noise really is, since you also have mac experience. Well in a normal office its not noticeable, only in a quiet room does it begin to bother me. Its quieter than my work laptop. My new Macbook Pro is quieter but it is also twice the price! Question of cost vs features really. Im happy with is as its fast as reviewed. Not clear on one pt: does the X 121e have a slot to play or rewrite / copy on a DVD???? Sorry for the delay, no the x121 has no dvd internal to it. Im looking to replace my TimeLine 1018tz with the x121e, and I have some questions about the screen? How are the colors on the x121e compared to the 1018tz? How are the viewing angle on the x121e compared to the 1018tz? I do some photoediting so it would be good to know before I buy…. To be honest the screen is not great, I wouldn’t recommend for photo work. The best pc screens are sony vaio or my own preference is a mac. The Lenovo I got as a fast workhorse machine. I have recently bought this laptop too. This laptop is great in a few ways like you have mentioned. Don’t need to repeat that. My findings with an SSD (corsair nova) are really good for this laptop. At first I thought the fan made a lot of noise, THE FAN ITSELF DOESN’T MAKE A LOT OF NOISE! When I put in an SSD, I clearly noticed the difference that you just dont hear anything at all. With the HDD you seemed to hear something zooming the whole time. Also before the SSD you felt quite a bit of heat (my opinion) on the bottom. With the SSD you only feel a small amount of heat at the CPU-side (I removed the casing of my SSD and placed it between a cut-out of anti static bag). My office-usage battery life before the SSD was close to 7 hours, now it seriously is around 8 hours with this SSD (could differ, the corsair nova is very power efficient). With having the choice of this notebook or an ultrabook, I would recommend this one for most people. The price is a lot lower, while your functionality, keyboard, screen, and build quality are good. Also NO whining fan noise from this notebook! I have used many notebooks before, and I know when you have a rather loud noise (take a 13-17″ with dedicated graphics at max load) and a soft noise (not all laptops tough, only intel integrated graphics, between 11 and 17″ screen). If you want to have a slightly cheaper option, go for the AMD version for about E400-E450. 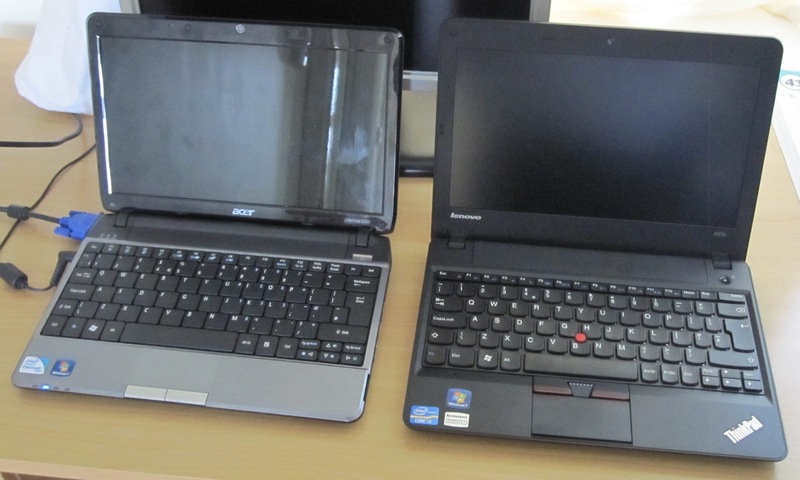 It is superior to most netbooks, you get a better build, performance and usability.